True has announced details of its iPhone release and the pricing that will apply in Thailand. Despite all the negative predictions over the last two years, the cost of the device and the fees are not too bad. However, there are a couple of negatives to the initial offering here. There was a small item (not online) in the Bangkok Post, Business Section, this morning (26 December) telling readers that the date the iPhone will be available is now 16 January 2009 and the location, as expected, is Siam Paragon. 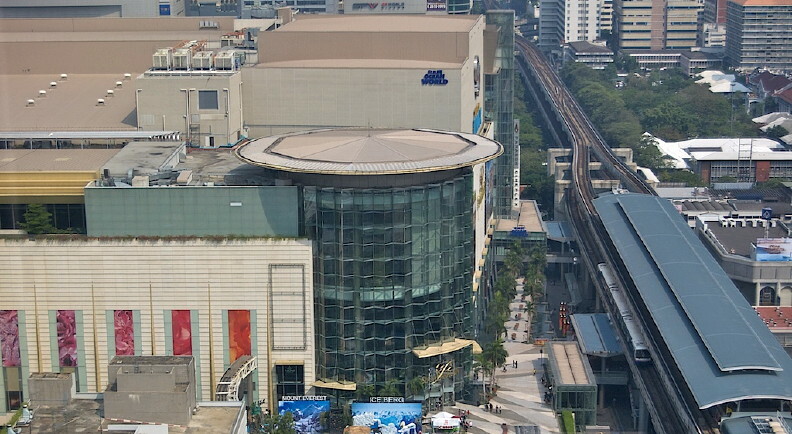 With this location in the center of Bangkok's shopping district, this may well be a big event and I would also expect to see personnel from the local Apple office there too. Using the links from Apple's own iPhone pages for the region, True now has a more detailed site for the iPhone here, compared to that of a few weeks ago which was really just a placeholder. Main links go to Thai language pages, so where I can I will use the English language links. The True pages do have English links, but some of the pages at lower levels are in Thai only. The True main page for the iPhone has three links: Price Plan; Services, Guided Tour, and Warranty. The pages, with their links and design, suggest that True has been working quite closely with Apple here. Keeping the best to last, at least in this part of the outline, I am going to work backwards and start with the Warranty section. The time periods of the normal warranty are 6 months and 12 months from the date of activation, depending on the specific product in the list mentioned: mobile phones, chargers, handsfree sets and SIM cards. With the Apple iPhone that is a 12 month period. There is also a list of exclusions from accident and misuse. True also excludes products that do not carry their stickers, so unlocked iPhones from Mahboonkrong are out. This section also shows the True branches that can offer advice and servicing. Apart from Future Park, Rangsit, there is nothing outside Bangkok. The Guided Tour section takes us back to Apple's own pages, which we have seen may times before. Services has brief information concerning what is or is not available. Wifi for sure, but 3G is shown as coming soon. There is a link on this page to a page that shows a number of games and other apps developed for the service: icing rather than cake. On the face of it, the fees are, as was suggested to me a few weeks ago, affordable. There are four plans -- Bronze, Silver, Gold and Platinum -- although the Bronze will not be available until after the launch: only the others are available for pre-launch registration. The Bronze, when it is available, requires the purchase of the iPhone at 6,999 (US$200) baht for 8G or 10,499 baht (US$300) for 16G. The monthly fee is 1,199 baht (US$35) for both of the devices and users must sign up for 24 months. It is unknown at this stage if the SIM card from other services will work in these phones (or those used with any of the other payment plans). The other services do not require the purchase of the iPhone, although the monthly fees are (understandably) higher. For the 8G iPhone the Silver, Gold and Platinum are 1,399 baht (US$40), 1,699 baht (US$49) and 1,999 (US$58) baht respectively per month over 2 years. The 16G iPhone is 1,599 baht (US$46), 1,799 baht (US$52) and 2,099 baht (US$60) for the same respective levels of service. With all the conversions here, I use the Apple Calculator application and its online conversions. The services allow for 100 minutes of talk time for the Bronze and Silver packages, with 200 minutes for Gold and 300 minutes for Platinum. 100 SMS (messaging) are free with the Bronze and Silver, with 200 and 300 for Gold and Platinum respectively, while EDGE/GPRS/3G allows 10 hours for Bronze, 1G for Silver, 2G for Gold and unlimited for Platinum. Bronze and Silver are permitted 20 hours WiFi use, with unlimited for Gold and Platinum. If users exceed these allowances, the fees charged are shown as 1.5 baht per minute for voice, 1.5 baht for SMS, EDGE/GPRS/3G 0.6 baht per Kb for Gold and Platinum, or 1 baht per minute for Silver and Bronze. Wifi is charged at an extra 1 baht per minute (Bronze and Silver -- Gold and Platinum are unlimited of course). Each of the pages has a pair of buttons: Main Page and "Go For It" which begins the registration procedure. Only customers who register via the web can collect the phone at the launch. The start of the process requires selection of a number, if one does not already have a True line. It took a number of attempts before I could select a series of four digits that was available, then a list of numbers (service and area code) with those digits is revealed. Using a button we are also able to select from one of the four provinces covered: Bangkok, Nonthaburi, Nakhon Pathom and Samut Prakarn. There is a lot of detail in this application process and several of the items are starred as required, including name in English and Thai. Although I have this on my business card, copying the characters is not easy and the help of a Thai friend was needed. Most of the other information is standard here for applications. Once that is done, we move on to the device selection and the plans. This is not available in English at all. The Bronze plan -- the cheapest -- is not available until 16 January, so at this stage users may only select Silver, Gold or Platinum for either the 8G or 16G iPhone. If users want the Bronze service, therefore, they are unable to pre-register and unable to collect the phone on that first day. However, by signing for the 2 years that these services require, there is no charge for the iPhone itself. The iPhone for the Bronze service is 6,999 baht for 8G or 10499 baht for 16G versions. The last couple of pages are in Thai only, ad this is where it really gets frustrating. We must choose the time: there are three 8 pm to 9pm, 9 to 10 and 10 - 11 at Siam Paragon. Having decided on this, we are finally directed to a booking page where credit card details are required. Despite entering details several times, it is only the cards from Bangkok Bank or the Thai Farmers Bank that can be used. I am afraid I abandoned my application at this time and will make other arrangements, perhaps paying for a phone and using the cheaper Bronze service. While I have been lusting after one of these devices since I first held one in my hands in the bowels of the Moscone Center the day after its initial announcement, that long wait has tempered my approach and, although I may probably attend the launch party on the Friday evening (much as I hate being in central Bangkok after dark because of the journey back home), I am willing to wait a day or two -- a week or two -- rather than jump through True's hoops with its unfriendly registration.